Find a great deal on the Doro PhoneEasy 612 with TigerMobiles.com. A convenient flip style phone with a camera and a bunch of special features for older customers (like an assistance emergency button), this is a fantastic buy! Think you or a loved one could use an easy to use mobile? Then just check out our deals on the Doro PhoneEasy 612 below. There are tonnes of mobile manufacturers on the market, but Doro is a very particular brand. The Swedish company designs phones specifically for older users. While they do make a simple to use smartphone, Doro are better known for making old style bar and flip phones. 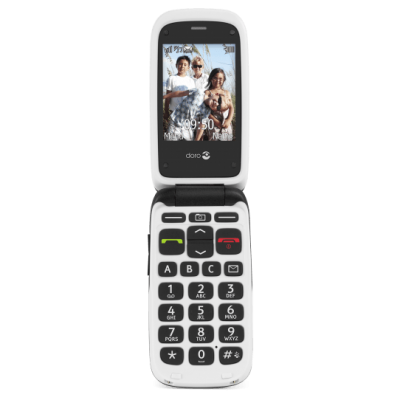 The Doro PhoneEasy 612 is their latest flip phone model, and while it doesn’t have an internet connection, it does have plenty to offer. Why should you buy the PhoneEasy 612? It’s got a big, bright screen with easy to read large type, there’s a camera on board, there’s even an emergency assistance button, just in case you need help, and it’s hearing aid compatible too. If simplicity and security are your thing, then the Doro PhoneEasy 612 is going to be just the ticket. The PhoneEasy 612 is a retro flip phone, or clamshell style if you prefer. It’s plastic, complete with rubberised grips around the back, and sits very firmly in the hand. And that flip means you can’t accidentally press buttons! There’s also a numeric keypad, with large buttons. Finally, there’s an emergency assistance button at the back. Under the cover you’re getting a camera, as well as extra elderly friendly features. The PhoneEasy is hearing aid compatible, for example, and all type (both on screen and on buttons) is large and comfortable to read. The screen is bright, and shortcut buttons make the PhoneEasy simple to navigate as well. We’ll be honest: the PhoneEasy isn’t a mobile for just anyone. But for those with vision or hearing problems, or those that only want a phone to text and call in an intuitive way, then the Doro PhoneEasy 612 is going to be a fantastic deal. This phone isn’t about performance. We’re not going to talk about processing power and RAM here since the PhoneEasy isn’t a smartphone. All you need to know is that the PhoneEasy is more than powerful enough to do the simple things it’s designed to do. The keypad is responsive, there’s no lag, and you can do everything you need to do. There’s also no real operating system on board; this isn’t an Android, Windows, or iOS device. But the PhoneEasy doesn’t need an OS since it’s not a smartphone. What it does have is a specially designed interface that’s simple, intuitive, and very, very easy to use. It’s difficult to rate the PhoneEasy regarding performance in the way we normally would. But the bottom line here is that the PhoneEasy does exactly what it was designed for, and it does it very well. Not only that, but it’s simple enough that even a toddler shouldn’t have any trouble. The PhoneEasy has a full-colour screen, measuring in at 2.4 inches, which is more than comfortable for reading. And again, all typefaces are large print and easy to read. Resolution is 240 x 320, which on a small screen works out just fine. The picture here is crisp, and more importantly, everything is easy to see. There’s a number pad keyboard, with large buttons. Texting is possible since each key is assigned a group of letters. The keys are easy to read as well, and satisfyingly tactile, making a solid click when pressed. There are hotkeys too, which we’ll get to in a while. The Doro PhoneEasy 612 doesn’t feature a front-facing camera, though that isn’t exactly standard on flip phones anyway. There is a rear camera, however, a 2 MP device with video recording and even digital zoom. Image quality is solid, though not brilliant. But the PhoneEasy camera is more than good enough for a quick snap. From pics of the grandkids to snaps of your shopping lists, this camera is pretty convenient to have. There are a few more things that deserve mention here. We’ve covered features for the visually impaired with those big buttons and big print, but the PhoneEasy also caters to the hearing impaired. It’s compatible with most major hearing aid models, and device sound is deliberately loud and clear. On the keypad, there is a row of three hot keys at the top. These can be programmed to different numbers, letting you call a friend or family member at the press of a button. There’s also and emergency assistance button at the back of the phone. This can be programmed to either a family member or to emergency services and is easily pressed in case of an accident. A large battery gives more than a day’s use between charges, and an included cradle can be used for charging (so no fiddling about with cables if you don’t want to). Finally, there is a start-up wizard. When you first switch on the phone, this wizard will give you easy to understand, step by step instructions, so you know all the features and can set up your phone. The Doro PhoneEasy 612 is exactly what it says it is, it’s an easy phone, and that’s no bad thing. A convenient flip phone style, with camera and a host of special features designed to help older and less able customers, the 612 might be pretty specialised, but that’s what makes it great. From large type to emergency assistance, this device has everything an older consumer might need. This is only a 2G device, and has no internet connection, though it does have Bluetooth. You’ll get just 12 MB of internal memory, which is fine for storing phone numbers and a few pictures. However, you can add an SD card for up to 16 GB of extra storage if you’d like. Right, so, do we have any complaints? Not particularly. There’s a lack of internal memory, but the SD card slot makes up for that. The side-mounted volume buttons are maybe a little small (especially when compared to the large keypad buttons). But since most users aren’t likely to play with the volume too much, this isn’t really a deal breaker. On the whole, we’re very impressed with this phone. If you need a simple, easy to use mobile that has plenty of features designed for the hearing or visually impaired, then the Doro PhoneEasy 612 is the clear choice.